Magma m-pipe made from Victrex PEEK-based solutions, used in next-generation jumper assemblies. Following the joint development of a carbon composite m-pipe PEEK specialist Victrex has invested in a minority interest in pipe manufacturer Magma to boost the adoption of its m-pipe for subsea applications. The investment is in line with Victrex´s strategy to develop selected semi-finished and finished products, in addition to supplying its core polymer, the company said. The m-pipe technology could reduce exploration and production costs and risks in demanding subsea applications. Increasingly stringent demands for operations at greater depths, with sour service demands, and under higher pressures and temperatures, have made a metal replacement for subsea piping an urgent priority for the oil and gas industry, Victrex says. 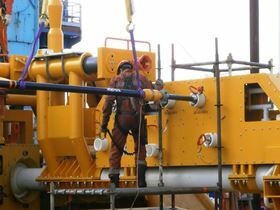 ‘The oil and gas market remains challenging, but the application of m-pipe in areas where it can deliver cost savings for operators, through simpler design, easier deployment and in whole life costs, means it should be the technology of choice for demanding subsea applications,’ said Martin Jones, CEO at Magma. This story is reprinted from material from Victrex, with editorial changes made by Materials Today. The views expressed in this article do not necessarily represent those of Elsevier. A joint venture called TxV Aero Composites has been established to improve the adoption of PAEK composite in aerospace. Polymer specialist Victrex plc has acquired Zyex, which makes PEEK based fibers for the aerospace, automotive and industrial markets.